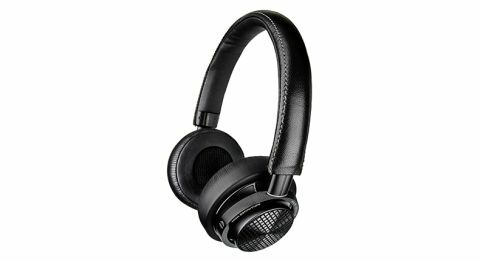 Philips Fidelio M2L review | What Hi-Fi? Apple only ditched the headphone jack a few months ago, but Philips has been touting a pair of Lightning-connector headphones in its line up for a lot longer. What once seemed like a pretty niche product, now seems ahead of the curve. If the Fidelio M2L look familiar, that’ll be because they cut a remarkably similar shape to their wireless M2BT stablemates. Of course, these are very much wired and proud, sporting the Lightning connector and their own 24-bit DAC and amp. They’re an on-ear fit with a leather and aluminium design, and memory foam earcups. Controls for volume and music playback sit on the right earcup instead of the inline remote, but there’s a still a built in mic for taking calls and using Siri voice commands. These earcups, which house the headphones’ 40mm drivers, also swivel flat for easier portability in the included carry case, but they feel sturdy enough to take on the go without worrying too much about knocks or scratches. That goes for their cable too, which is thick and durable. A bit more flexibility wouldn’t go amiss though – it has a tendency to hold on to kinks if the wire gets bent, plus it’s fully fitted, so there’s no way of swapping it out for a 3.5mm cable to use with other devices. They’re perhaps a little snug in their fit to begin with, but they’re lightweight enough that they don’t weigh down your ears too much during longer listening sessions. If other Fidelio headphones are anything to go by, we’d expect them to loosen over time too. Play No Church in the Wild by Jay-Z and Kanye West and the M2Ls jump behind the track’s beefy bassline with enthusiasm, giving plenty of weight to the low-end rumble, but with more control and a touch more balance than we’ve heard on other Fidelio headphones. Timing here is great, with the M2Ls displaying a punchy rhythmic ability that moves the song along with both drive and authority. There are various strands to the song’s instrumental, but they all tie in perfectly together, unflustered and well organised, without ever sounding clinical or held back. They strike a great balance, getting your toes tapping from the start, with a precise yet upfront and engaging sound that is instantly likeable. The balance is good, if still tipped slightly towards richer tastes, but with a midrange that’s clear and detailed and a treble that steers away from hardness. Change to the softer When I Met You by Fantasia and the M2Ls relish the more vocal-focused track, digging out detail and texture. Harmonies are voiced with separation and clarity, while the tempo changes in the latter part of the song are delivered without a misstep. Busier arrangements can sound a little penned in compared to pricier over-ear cans, but at this level, there’s little to grumble about. Despite being one of the oldest pairs on the market, the Philips M2L headphones are one of the best pairs of Lightning headphones we’ve heard, offering a refined performance that’s detailed, dynamic and full of energy. A little more money could get you something like the B&W P5 Wireless, which can be used across all manner of devices, but if you’re keen to stay wired for now and need a Lightning connection, these should be high on your audition list.